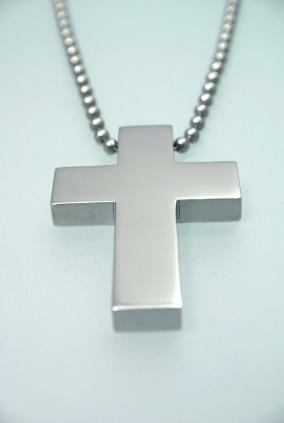 Men's brushed stainless steel cross necklaces make great gifts for just about any occasion. There are many reasons why some men opt for stainless steel jewelry over precious metals, such as silver and white gold. Cost is one of the biggest considerations, since stainless steel jewelry is a very affordable alternative. Metal strength is also an important factor. The phrase, "hard as steel" is used as a comparative when describing the strength and durability of various non-steel products. That's because steel is a strong metal, and is even stronger than silver and gold. In fact, it's over 1,000 times stronger than platinum, which is often prized above gold and is also a more expensive metal. With a brushed stainless steel cross, your man never needs to worry about scratching, bending or ruining this piece of jewelry. Stainless steel is known as a metal alloy, which contains between 10.5 to 11 percent of the metal chromium. It's this inclusion of chromium in the composition of the metal that prevents the steel from staining or rusting. You've probably seen very shiny stainless steel appliances and other products that show every fingerprint. Brushed stainless steel doesn't have that kind of shiny surface. The manufacturer creates the brushed effect by using sandpaper or a similar abrasive that is a fine grade. The abrasion lines in the metal give it a brushed finish. When shopping for men's brushed stainless steel crosses, you'll quickly discover that many of the stainless steel crosses have a shiny finish similar to that of a silver cross. Many of the crosses that are available in stainless steel are Gothic designs. Sharp edges and large heavy designs are quite common for a brushed stainless steel cross. Other designs are very abstract and modern, while some are simpler. One very popular style is based on the shape of a nail to reflect the nails driven into Christ's wrists when he was nailed to the cross. Some crosses are rugged with spikes twisted together to form a rustic-looking cross, while others are smooth and feature bluntly cut ends. Some look like solid metal tubes cut at an angle to reveal the brushed metal grain. Stainless steel crosses are growing in popularity, especially in Europe. Amazon: You can find a good selection of stainless steel crosses on Amazon. Some of the styles you find on other sites are also on Amazon, so you may want to do some price comparisons before you place any order. Vincenzo Taormina: Here you'll find a large selection of brushed stainless steel jewelry pieces, especially crosses. Most of the necklaces are black rubber or black leather to complete the masculine look. West Coast Jewelry: If you like the dog tag look, you may like a black stainless steel cross set into a brushed stainless steel dog tag at West Coast Jewelry. If you prefer a more traditional look, you're sure to find it among the many crosses offered by this jewelry shop. Whatever your man's style, you can choose from the men's brushed stainless steel cross necklaces available to fill just about any bill for design, style, and of course, long-lasting wear.